~ There are other paint supply stores such as De Serres, Above Ground, Micheal's Art Store etc, [lots of small art stores not mentioned - my apologizes] who carry the same or other brands and some offer workshops on materials near the GTA. Prices vary and availability. ~ Comments marked with a NOTE following each product are mine. Primary Colours - pure colours should be the best quality you can buy. You have the best control over your colour this way. I recommend Quinacridone versions as the pigment is finely ground and more transparent. If you can't find the Primaries then you will have to buy more variety - eg: instead of Primary Yellow you could try Hansa Yellow or Cadmium Yellow. If Magenta isn't available, try Rose or Crimson. Each colour is affected by another. You can lose control of your colours, sometimes making them dull or brownish, when you use all premixed colours. Adding a primary colour will change the colour in a controlled manner. If you use a certain colour a lot then it makes sense to buy it. Titanium White is a basic white that is opaque and very white. I use Warm White for snow and Titanium for highlights. Zinc white is more transparent and offers a subtle colour shift, best used in portraits. Blacks are also different or can be made different by adding metallics, warm or cold colours. Try out a few. I like to add colours to black for contrast. Product:... Brush Set Durable brushes at a reasonable price. FLAT - a softer and more flexible brush similar to the Bright in appearance but longer. FAN - a great blender and special effects brush. Many companies offer sets like this. Do not buy too cheap a set. Check out the single brushes in each line. Check for stiffness to the brush bristles and condition. You want them to pick up the paint and lay it down properly. You also need a variety of brushes. You should try to buy at least 3 sizes of each brush type. I started out mainly with nylon brushes and loved their crisp edges. Natural hair or fiber brushes like Hogs hair or Sable offer both a soft or a scratchy effect. I use both in oil and acrylic. After using nylon brushes you might be upset trying out the coarser fiber brushes - however they offer soft blending as well as soft edges. Do not leave your bristle brushes in water -they soften too much - this is why they are used more often with oil. Best to wipe all brushes clean while working and give them a thorough cleaning when finished. Brush cleaners are very effective. Long handles are for working standing at the easel and are more flexible. Short handled brushes are used for desk work - working close at all times. …. The blades are highly flexible … and are therefore more responsive on the painting surface. Several shapes and sizes are available permitting varied stroke possibilities. Each knife is fitted with an attractive 110mm acacia wood handle and brass sleeve. These Italian tempered steel palette knives are crafted from the very best quality materials. These knives are stronger and less pliable than painting knives, designed specifically for lifting and mixing quantities of color. NOTE: I recommend the metal knives with the angled neck as they are easy to clean, are very flexible and long lasting. Each size allows you different control and effects. ...... 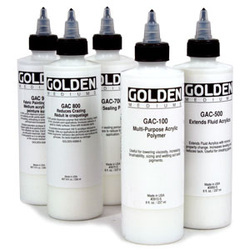 NOTE - I use and support the use of GAC 100 for thinning acrylic paints. It has a soft luster and allows paint to move easily and transparently. GOLDEN Molding Paste is a thick gel mixed with a finely ground marble dust. The marble imparts a hardness to the dry surface and quite a bit of weight. When mixed with color, it will create a tint. Molding Paste dries white and is opaque. In the example GOLDEN Molding Paste has been applied with a palette knife, spread over the surface leaving the texture of the knife. Mixing the Molding Paste with GOLDEN Iridescent Stainless Steel paint produces the lightly speckled gray surface. GOLDEN Fluids were thinned with water and applied in a thin watercolor like fashion to the dry surface. Because the Molding Paste is a fairly slick surface (not porous) the paint sits up on the surface, puddling (note the sky) and creating a look quite different from painting on a more absorbent surface like watercolor paper. 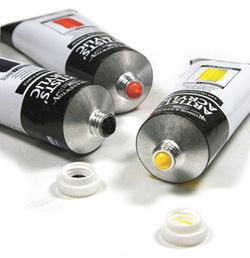 Golden Fluid Mediums offer artists infinite control of changing acrylic colors. Use Mediums to control transparency, viscosity and surface sheen. Golden Mediums can be thought of as colorless paints, as they are composed of similar polymers as are the acrylic paints. They are the "glue" or binder that dry to form continuous, durable films. They are made of 100% acrylic polymers, which have proven to have excellent flexibility and chemical, water and ultraviolet radiation resistance. This is a very unique ground developed for a watercolourist who desired to paint on canvas or boards. Its properties are similar to painting on watercolor paper without the warping. Apply a coat of Gesso first, let dry and then apply the Absorbent Ground. Often people overlook GOLDEN Micaceous Iron Oxide, because it is so dark. It is not officially a ground, but works beautifully as one. The Micaceous Iron Oxide is a deep black color, has a very gritty surface and a sparkle or glint to the surface (You cannot see the sparkle in these scanned images). The grit is perfect for pastels or oil pastels. For a ground, layer it on thickly or scrap it down with the edge of the palette knife allowing the color of the board to show through. The example is a very thick layer, about 1/8-inch thick. When this was dry, the image was drawn in with oil pastels. The texture of the palette knife strokes imparts a painterly quality to the pastel strokes. The darkness of the background provides an eerie atmosphere. While it's possible to apply Crackle Paste onto a wide variety of surfaces, the extreme shrinking can warp flexible products like paper or canvas. Therefore, applications onto rigid supports such as wooden panels or hardboard are recommended. Prime the surface with 2 coats of Gesso for proper adhesion. Crackle Paste is a thick, opaque cracking material... Dries to an opaque, matte finish ... can be applied Tinted easily with acrylic paint. Cleans up with soap & water. NOTE: I have focused here on one company but I use other products from other companies as well. I like Golden but am not endorsing them. Their paints are professional grade and the colour and texture is distinctive. Many companies offer student and professional grade paint and brushes - look for them. If you can afford it I always recommend professional grade. The pigments are pure and the paint is rich. that the chemicals are compatible from paint to medium. I have seen colours affected - paint curdling, when different products [student grade and professional of different companies] are combined. Colours may vary from company to company. Each medium changes the nature of the acrylic paint. The fluid mediums thin the paint and spread it more easily. The heavy body mediums extend your paint and also build thickness. 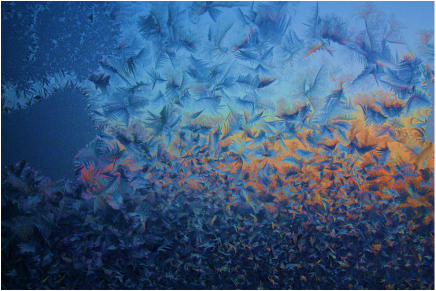 The more glazing and use of transparent mediums the more luminous is your paint. Be aware that some sheen is added to your paint unless you use matte medium. Galleria Acrylics are ideal for [students]. The range of 40 strong, vibrant colours in the 60 ml size, exhibit smooth and free flowing consistency offering a wide colour spectrum. The versatile Galleria paint range can be used in a wide variety of techniques, from pale washes to rich textural impasto. Using the extensive range of Winsor & Newton Acrylic Mediums, colours can be modified to create a wide variety of different effects. Due to excellent adhesion and a quick drying nature, over painting is possible within 20 minutes. NOTE: This company offers many sizes and quality in their paints - both in oil & acrylic. A few others do as well. In the case of Golden paints [where colour clarity is higher and in the case of the heavy body paints - they are thicker] - they put a sample of the real paint on the tube so you can see the colour and the transparency. I like using the larger tubes rather than the tubs. I do buy white in jars but the other colours seem to dry too quickly with the larger lid. If you are buying a colour you aren't using often, then buy a smaller tube. Acrylics will dry over time even unopened. Oils stay fresh for a long time. Primary colours are often harder to find in student grade paints and are not the same colour as professional paints. No colour shift - brilliant colour that stays brilliant! Winsor & Newton Artists' Acrylics colours .... provide excellent permanence & a much longer open working time for a better painting experience. There's time to "play" with the paint without any skinning or drying. Offering a thick & buttery consistancy, Winsor & Newton's Artists' Acrylics hold brush & knife texture well & are made to meet the expectations of the most demanding artist. All 80 colours dry to a satin finish. Most companies offer this product. It is offered premixed in the tube by a few companies. I have used it to thin my paints and to add luster to them as well - they appear to improve your student grade paints. Attention: Do not use too much - drying time will be long and when using a wet-palette to store mixed paint - If your paint has retarder in it, it will harden when stored, unlike the untreated paints. Although it slows drying time while working, it makes the paint solidify over night. Paint not treated with retarder is still wet for days, in the wet palette. 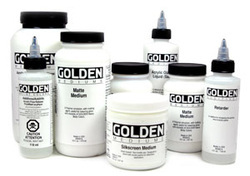 Golden Fluid Acrylics offer intense, permanent acrylic color and have a consistency similar to heavy cream. Produced from light-fast pigments, not dyes, they offer strong colors in a thin consistency. No fillers or extenders are added and the pigment load is comparable to Golden Heavy Body Acrylics. Fluid Acrylics offer fine dispersion, high tinting strength, durability, and excellent adhesion. Due to their low viscosity, fluid paints load a brush more easily than thicker paints, produce longer, more uniform strokes. NOTE: These fluid paints are very good quality. I can't speak for the other brands offered. I am introducing them as an alternative to the heavy body paints. You can mix then easily, they flow better onto the painted surface. For special applications they can be drizzled or poured onto the painting, allowing immediate interaction - no mixing until it is thin enough for glazing technique. High realism artists use this product to stop any texture from developing. Inexpensive Fluid Body Acrylics are very dry and full of filler and their colours may appear dull. In order to protect the paint film if varnish removal is required for restoration purposes, we recommend that an intermediate layer of an isolating medium be applied. An isolating layer is a transparent film that physically separates the underlying layer of paint or other medium from the varnish to be applied. When a solvent is used to dissolve the varnish, the isolating layer will prevent it from reaching the paint layers, where damage, mostly in the form of color pickup (solubility), could occur. The isolating layer is also of critical importance when applying a matte varnish over an absorbent surface (such as a stained surface) to prevent a cloudy or "frosted" appearance from occurring. This frosted appearance results from the varnish and solvent being absorbed into the support, while the matting agent remains exposed on the surface, where it appears as a white solid. Golden Soft Gel (Gloss) thinned with water is a suitable isolation coat. It provides adequate leveling and foam release. Paints - There are many brands and more every day. I have been using Winsor Newton and Duo. Winsor Newton offers an oil paint experience that is very similar to oils - some paints are thicker and some are thinner, just like the oils. Duo offers paint colours in all the same texture so they blend much easier - it is a personal thing. A similar company is Cobra [found 3/4 the way down the PDF file - p26 of 36]. Cobra's oils are very fluid [oily] and they have a lovely colour selection. Their gels come in tubes which is very convenient and tidy. 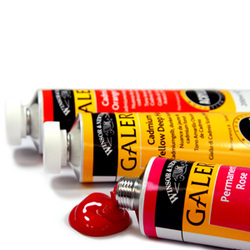 Gels & Mediums - work like thinners or thickeners for your paints to allow them to more more fluidly or give them body. They remind me of the Winsor Newton Liquin I bought that is for oils. Liquin comes in a variety of thicknesses and can be mixed with water soluble oils. [NOTE: - you cannot use damar varnish on a painting with Liquin in the paint.] I have bought the Winsor Newton Water Soluble Medium and it works quite well - however there is a lot of oil left on the painting and that is why I prefer the gels which offer fluidity but leave less luster. Brushes for oils - I keep a separate set of brushes for my water soluble oils. Even with cleaning you will probably feel a difference in your brushes after using oils. I bought 2 packets of the Winsor Newton brushes that are made for this product. They are very good quality nylon brushes. I have bought more brushes for larger and specific use. Bristle and hair brushes are also added to the mix [Escoda makes great bristle brushes as well as natural or synthetic], just like with my acrylics. TerraSkin - alternative to canvas or board. Looks like 'paper' - but it doesn't react to water. Made from 75% mineral powder (ground calcium carbonate or limestone) & 25% non-toxic resin, this paper uses no paper pulp, water or bleach during manufacturing. The 348 lb paper feels similar to a 300 lb watercolour sheet, but is not as stiff as it does not contain any sizing. Roll it up to transport & it will flatten in a few minutes once unrolled. Paint loves this acid-free paper. It features a subtle tooth that holds paint well without any slickness. No priming needed as this water resistant paper doesn't buckle, & makes an absolutely ideal surface for oils, acrylics, charcoal, pencil, pen & ink, watercolour & more. Rip resistant, it's wonderful for embossing, scoring, cutting and printing. NOTE: Quantities of 10 or multiples of 10 now ship rolled. TerraSkin has no memory and will flatten in a few minutes once unrolled.